Oh, Oh It's Magic (Color Scratch Postcards)! Travelers kicked off their fall employee giving campaign with a little magic– magic color scratch postcards, that is. The Greater Hartford Arts Council was invited to participate in Travelers’ employee giving campaign with a number of other local organizations. But employees showed off their creative sides by participating in our Magic Color Scratch Art Postcard competition, and boy are they artistic! Last week we visited Travelers during their employee carnival picnic, featuring a cookout, carnival-themed games, and great prizes. It was a perfect end to the week with sunshine, laughter, and fun! There we chatted with employees and encouraged them to show off their artistic side. These magic cards are super fun and super easy. Just scratch off the black topcoat with the drawing tool or a pencil to reveal the rainbow colors underneath. 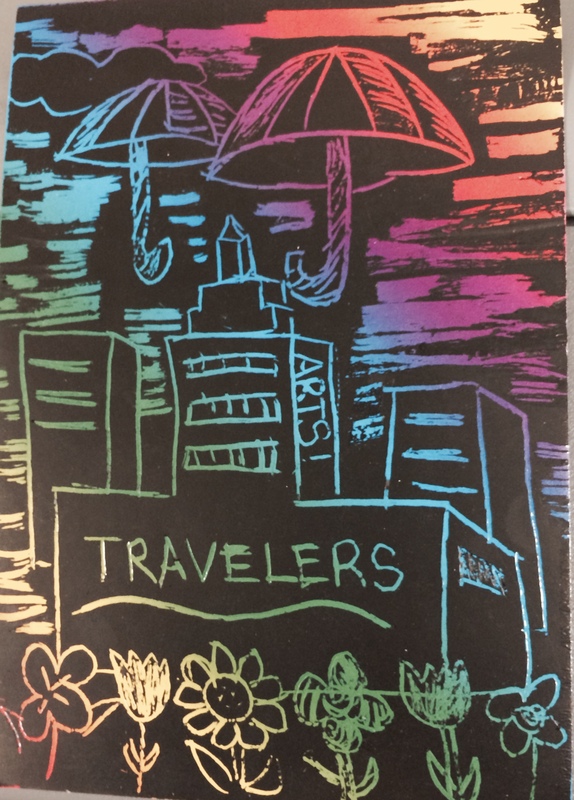 The Travelers employees must have been itching to show off their creativity (or they were excited to be entered to win tickets to TheaterWorks, Hartford Stage, or the Hill-Stead Museum). Either way, they created beautiful pieces of art to decorate their offices. Two of our winners are featured here in this post. But thankfully, the creative outlets and fun don’t stop there. During the course of their fall campaign Travelers will host Bill Dougal, a funny and engaging artist who can create your caricature in under three minutes, Ben Dean, an amazing electric violinist who uses technology to blend his music, and Jesse Combs, a local young musician who puts you completely at ease with his guitar. What could be better than a line up like that? By engaging the employees in these artistic opportunities, we are challenging employees to be their best, helping to create an environment that blends backgrounds and interests, and showing employees how much they are appreciated (The pARTnership Movement). Interested in bringing these and many more Arts Breaks to your workplace? Visit our Workplace page to learn how we can partner together to bring creativity and art to your employees!